Neva Goodwin is co-founder and co-director of the Global Development And Environment Institute at Tufts University, where her projects have included editing a six-volume series, Frontier Issues in Economic Thought (published by Island Press) and a Michigan Press series, Evolving Values for a Capitalist World. She has edited more than a dozen books, and is the lead author of three introductory textbooks: Microeconomics in Context, Macroeconomics in Context, and Principles of Economics in Context. 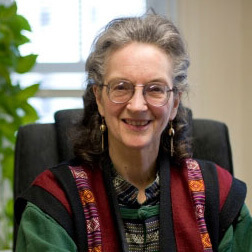 Over the past decade Dr. Goodwin led the creation of a “social science library” called Frontier Thinking in Sustainable Development and Human Well-Being which contains nearly 10,000 full bibliographic references, representing seven social sciences, and including full text PDFs for a third of the referenced articles and book chapters. She received a Masters’ degree in Public Administration from Harvard University’s Kennedy School of Government in 1982 and holds a Ph.D. in Economics from Boston University (1987).